We love our pets. Our dogs are members of the family. To many of us, they are one of the kids – the furry one. But are we as careful with what we feed our pets as what we feed our children? Frequently, ads for pet food claim that they have “real” food, but the ingredients end up being things like wheat gluten meal, animal by-products, and corn by-products. Nestle’s Purina Beneful brand, one of the most popular brands of dog food, is currently facing a class action lawsuit claiming their food caused serious health issues or even death in over 3,000 dogs. A little digging into consumer reviews of Beneful comes back with story after story of dogs suffering from massive internal health issues. Maybe it’s time to start looking more closely at the food you’re feeding your dog and start replacing the chicken by-product meal with actual chicken. What’s the Deal with Conventional Dog Food? There are many dog owners waiting for the decision in the class action lawsuit against Beneful. Reviews from dog owners who have fed their dogs Beneful have similar distressing symptoms. These dogs develop incontinence, internal bleeding, liver malfunction, and seizures. There are two ingredients that are potentially causing the most damage. The first is propylene glycol, a chemical used in antifreeze that nevertheless has been approved by the FDA for dog food and other products like salad dressings and cake mixes. Propylene glycol has caused products to be banned in Europe. It is considered less toxic than the ethylene glycol usually used in antifreeze, but it’s still a chemical you don’t need your dog ingesting. Another possible cause of these dog poisonings is mycotoxins from improperly stored grains. With the widespread incidences of liver failure cited in the lawsuit, it makes sense that this is being caused by toxins. Dog foods contain large quantities of grain from multiple sources, so the testing for contaminated ingredients is inconsistent and ineffective. Lax testing and regulation coupled with the tendency of large corporations to meet the bare minimum standards for quality makes it more than possible that Purina Beneful and many other dogs foods contain mycotoxins. 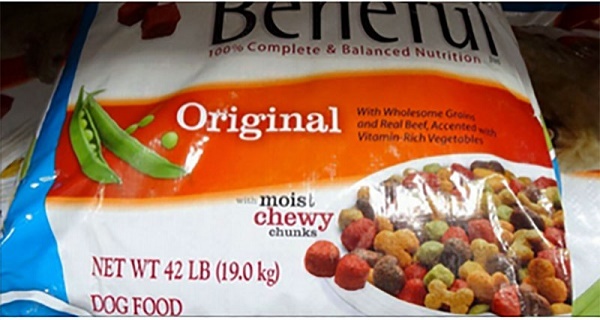 Several consumers report that their Beneful products had maggots. Many of the symptoms reported by pet owners are consistent with mycotoxin poisoning. Because conventional dog food relies so heavily on grains, without extensive regulating, the threat of mycotoxins will always be there. Is Homemade Dog Food the Answer? It’s interesting to note the ways in which food for dogs mirrors our food. Conventional dog food brings to mind fast food – cheap and easy. What would happen if we put as much care into our pet’s food as we do into ours? It sounds like a lot of work and a lot of money. Even so, reading the stories from Beneful customers who have had to rush their dog to the vet, watched them suffer, or found them dead is sobering. Does the time and money balance out in the end? Check the ingredients in your dog food. Avoid animal by-products, excessive grains, sugar, and preservatives. Making your dog’s food at home allows you to feed them a balanced diet of whole foods with any chemicals or preservatives. Mix raw, organic vegetables and organic, grass fed ground meat like beef or bison in a food processor. You can use a variety of vegetables (no onions, though!) and also add extras like eggs or avocado. If your dog is having health issues, homemade food can make all the difference in the world. Check out Cancer cure (for dogs only). We also give all of our dogs (and humans) in the family, Total Nutrition Formula. Your pets are important members of your family. Why not show them a little extra love with a better quality of food?